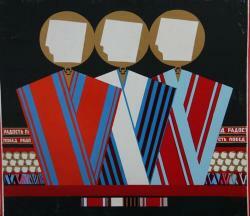 Boris Orlov is one of the originators and most brilliant representatives of Sots-art. He defined himself as an “imperial artist.” He was similarly drawn to ancient totems, Roman portraits, Byzantine materials, Baroque art, classicism and Stalinist monumentalism. As Orlov noted “I was immediately interested by the foundations of the imperial style: why, during a period of many thousands of years, were some models repeated time after time. Realizing that I live in an imperial time, I saw that some travelling subjects are blossoming again in the modern realities, but the framework which this exterior is pulled over has the very same structure. I began to study this framework, isolate it, and to search for it like an architectural model. Becoming infatuated with these architectural models, I ended up in Ancient Rome, and in the Byzantine Empire, and in Peter’s baroque. Here we have Rastrelli, David and Napoleon in flowing silk.” In the traditions of the imperial style, Orlov began with sculpture, combining constructivism, the posters and laminates in the ancient style. 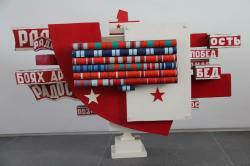 The Suprematic rectangles in Orlov’s work are wrapped in the ribbons from medals, architectural models become imperial totems, and ancient heads crown the bodies of generals, soldiers and sailors. In the 1990s Orlov left pure sculpture, moving to installations and photography as his means to portray the authentic remains of the Soviet empire. “Having earlier declared himself a talented sculptor, he developed his own, original understanding of the conception of “Sots-art”. His works speak in their own voice, which the viewer always will distinguish from the voices of the other participants of this historic choir. 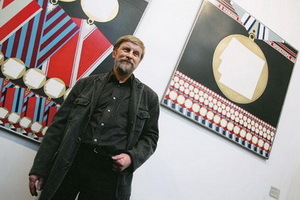 The impressive “imperial decoration” inherent to Boris Orlov’s works has gradually put them on the same level with the most outstanding artists produced by the Soviet Union.” Vitaly Komar.